OnePlus 6 is currently available in five variants in the Indian market which also includes the silky white and Avengers special edition. However, OnePlus has unveiled an all new colour Red for the device. The device will sell at Rs 39,999 and will go on sale from July 16. The company had released teasers with the hashtag #TheRedYouNeed for the new variant and announced July 2 as the date of launch. Last year the company had launched a Red variant of the OnePlus 5T as well. 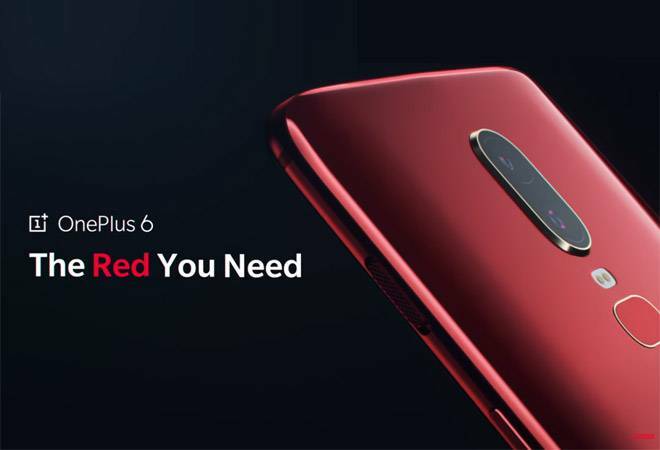 The company unveiled the Red variant of the OnePlus 6 on its Indian twitter handle. The device is going on sale in US on July 10.OnePlus 6 is the Chinese company's latest and greatest until the next variant which is expected to be launched later this year. The company introduced a notch for the first time and is equipped with Qualcomm's flagship chipset Snapdragon 845. The OnePlus 6T is expected to refine the overall experience of the device. To know if you should wait for the OnePlus 6T, read this: Should you wait for OnePlus 6T or just go ahead with OnePlus 6? The OnePlus 6 comes with an all-glass design protected by Corning Gorilla Glass 5 and "daily water resistance". The front panel is a 6.28-inch full Optic AMOLED display with a 19:9 aspect ratio, offering 84 per cent screen to body ratio. The OnePlus 6 comes equipped with a Qualcomm Snapdragon 845 processor with Adreno 630 GPU. For optics, OnePlus has given its flagship a dual camera setup at the rear with a 16-megapixel camera sporting an f/1.7 aperture and a 20-megapixel camera which also has f/1.7 aperture. OnePlus claims that the 16-megapixel main camera has a 19 per cent larger sensor with Optical Image stabilization and Electronic Image stabilization for better low-light photography and stable videos. The company introduced a bokeh mode in the camera app in an update after the launch. The phone supports 4K video in up to 60 frames per second and "super-slow-motion" mode for capturing high-definition video at up to 480 fps. OnePlus 6 is 7.75mm thick and weighs in at 177 grams. Initially the device will be available in two colours - mirror black, midnight black and later OnePlus will launch a limited edition silk white colour. For connectivity, the device has a dual SIM port with support for two nano SIM cards on LTE network. Other connectivity options include NFC, Type C, audio support via USB and Bluetooth 5.0.The OnePlus 6 also has a fingerprint scanner at the rear which is in a rectangular shape this time. Coming to what's in store for next year, the OnePlus 7 might come with 5G connectivity. Talking at Mobile World Congress in Shanghai, OnePlus chief Pete Lau said that the company is exploring its partnership with Qualcomm to develop one of the first 5G phones. The launch of the next OnePlus flagship, which is likely to be called OnePlus 7, will be in sync with the first yeatr of 5G in the US. OnePlus is also looking into carrier deals in the United States to expand its reach in one of the most important markets in the world.